MANSFIELD — Some residents in Richland County are receiving letters that are being generated as part of a scam. Richland County Sheriff Steve Sheldon is warning residents to not fall for this scam. The threatening tax letter is fake and threatens garnishment of wages and bank accounts, property seizure, federal tax refund offset, and the creation of a property lien if back taxes aren’t paid. Scammers are using the letters to prey on unsuspecting individuals. 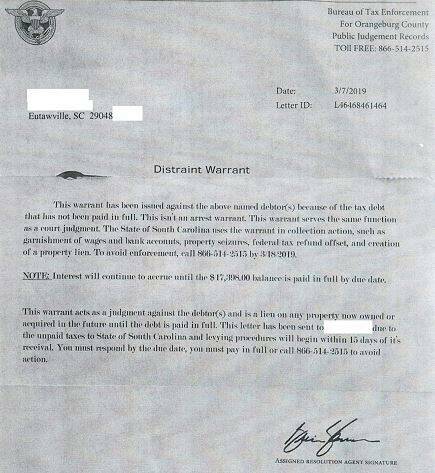 It claims to be a “Distraint Warrant” for back taxes. The letters are being sent throughout the country. Attached is an example of one of the letters. The ones sent to Richland County residents will say Bureau of Tax Enforcement for Richland County in the upper right hand corner of the letter and refer to the State of Ohio in the body of the letter.